Polypropylene (PP) honeycomb cores are a strong but flexible lightweight material that provides optimal mechanical performance in composite sandwich structures. ThermHex Waben GmbH manufactures a broad range of high quality, durable and economic core products with a standard density of 80 kilogram per cubic meter (5.0 Lbs / ft³). For applications with lower requirements to compression strength, ThermHex offers a lighter core with a density of 60 kilogram per cubic meter (5.0 Lbs / ft³). ThermHex honeycomb cores are available in thicknesses from 3 mm to 28 mm with cell sizes from 3 mm to 9.6 mm. Standard thicknesses are 3.5, 6, 10, 12, 15, 20, 23 and 28 mm. 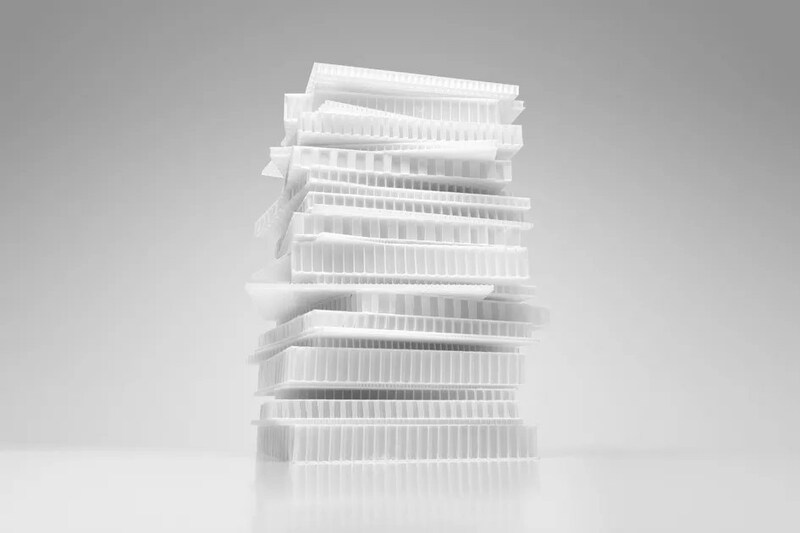 ThermHex PP honeycomb cores are produced in a continuous in-line production process by extrusion of a polypropylene film, vacuum forming and folding and includes also the lamination of non-woven layers and barrier films onto the core. The optimized cell size and the specific structure of ThermHex honeycomb cores offer an exceptional surface quality in sandwich components even with very thin skin material layers. ThermHex material comes in sheets of a maximum width of up to 1.400 mm. Standard panel length is 2.500 mm, while longer sheets are available upon request.